Been very busy working away in my studio. First off, pleased to say that my painting “UCLUELET” was selected for the Colour and Form Society 66th Open Juried Exhibition. This exhibition will take place from November 1st to November 29th, at the Etobicoke Civic Centre, 399 The West Mall, with an opening reception on Sunday November 4th from 2 pm to 4 pm. As well I am in their Artists to Watch section, and their newest Spotlight Magazine is off to the publisher right now, and I have been included.This is an International magazine that tell the story of what art looks like today, printed in Europe. Available to read online for free. I have just completed two paintings . First one is “The Sunbathers”, 8 by 10 inches, oil on canvas. Here you see close friends basking in the afternoon sunlight in their pond. 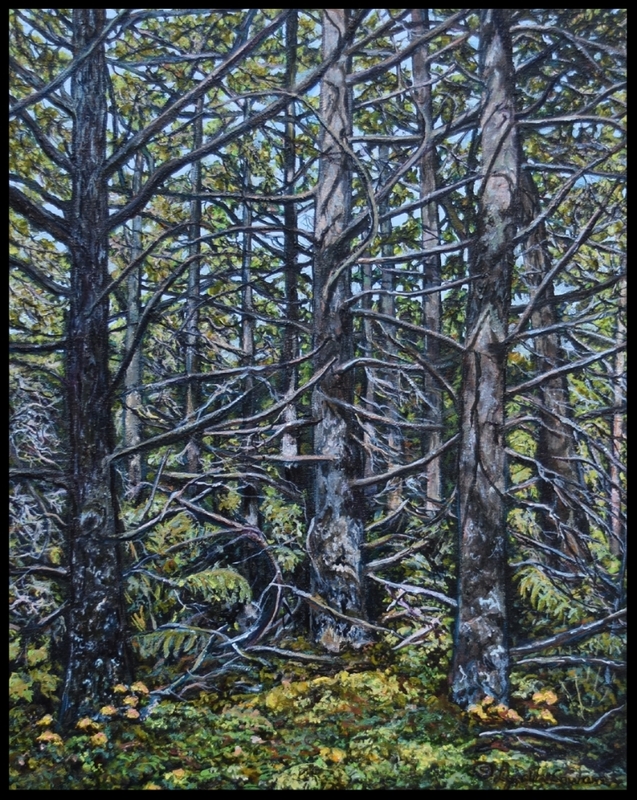 The second completed painting is “Meshed”, which is a scene from the old woods on the family homestead in Ecum Secum, Nova Scotia.The trees have withstood the harsh elements at Davidson Point and seem to have meshed together with their branches for support. The painting is a 16 by 20 inch oil painting. Currently I have three paintings “On the Easel “ that I am working on. They are in different stages, and of course, not all on the easel at once, just shown here so you have an idea of what the next ones will be. There are several more planned out, but I like to just concentrate on three main canvases at one time. When one gets completed, another begins its journey.